Renting in Varanasi India | Home of the Ganga. 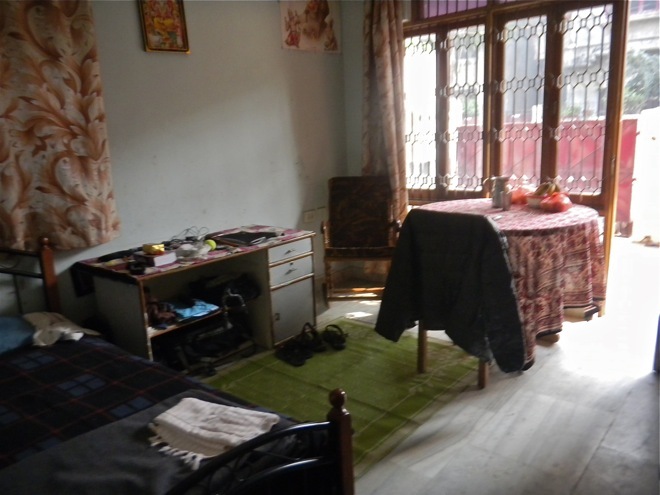 Renting in Varanasi India—The Home of the Ganga. Today I am Varanasi and will be for the next month or longer renting a flat. This situation materialized through meeting Mona in Slovakia during breakfast at a hostel. I stayed with her family (husband and kids) for about five days in Hyderabad. I inquired about a flat or personal space to rent and Mona contacted her cousin in Varanasi, and now I am staying at the cousins sisters house. The family lives upstairs and I have the downstairs and set-up the front private room with my own entrance and a nice front window. I can just step outside from my room and sit in the sun. It is a large downstairs house with two bathrooms, but currently it is unseasonably cold so I am camped in the room. Today we set up the kitchen so I can prepare raw salads—I am in need of raw food. I was a little shocked when I first walked in with just a bed on the floor, yet after some communication we created a comfortable room with a bed off of the floor, a hot plate for tea, a nice round table so I can do Internet work, another desk for my clothes and other gadgets, and a rocking chair. The Indian family is of the Jain religion and consists of the older father and mother, son and daughter-in-law, and their two little boys, and a maid. The daughter-in-law speaks enough English to manage and they are all very welcoming and pure vegetarian including no eggs, but do consume milk. They seem very happy that I don’t smoke or drink and I am more than happy to eat vegetarian food, but I am instead eating a lot of raw food. The family will cook me lunch everyday unless I am not at home, then I will eat raw in the mornings and evenings. Indian food consists of lots of carbohydrates, within one meal they may serve bread, rice, potatoes, and lentil Dal which is way too much of a carb punch for my system. The family is more than happy if I stay for three months, but we will see what happens. I am thinking of staying for two months now because of the ultra nice situation. You may have heard from other travelers and tourists that Varanasi is a dump. The reason for this is that all the tourists stay in the old city. The river Ganga and the old city is dirty, but the location I am staying is “clean” and normal for India, and the streets are the same as elsewhere. I am about 2.5 kilometers from the tourist river area. There are two malls with multiplex theaters in Varanasi, also, like everywhere else in India, a Domino’s pizza joint. So far here in the neighborhood nobody has attempted to charge me an inflated rate. Even the tea stall charged the normal cost of 3rs, which most places it has been 5rs. Of course 5 rupees is nothing but it’s the principle behind the concept. The northern area of India is ultra cold, up to 50 people have died in Lucklow because of the cold. I went out and bought top and bottom long underwear and now much better. The sun pops out everyday from 1200 to 1600 so it provides a good warm up. Long underwear here in India is called “inner-wear”.